Another day, another theme. Whew…I’m worn out now, but I’ll give you the details before I take a break. 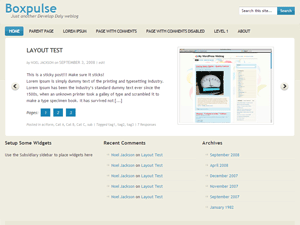 This theme includes a template for using a full-width slider, a feature often asked for by the Hybrid community. Check out all the details and demo the theme at the Boxpulse page. Lovely theme. Very pleasant to the eye. Can any design suit everything? [email protected] I think it is nice and simple. Lot better than some of the others I have come accross in recent days.